Made from cast aluminum and have hand painted decorative appointments. Comes with heavy wall hanging hook on reverse side and wall mounting hardware. Four Quadrant shield with red, blue and gold highlights. Detail includes , a griphon, fleur de lis, swords and star accents on the shield quadrants. Design also includes leaf flourishes, a knight's helmet and weaponry. 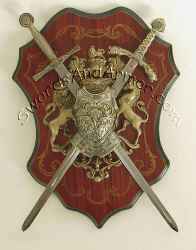 21 1/4" x 17 1/4"
Medieval Swords and Armor Specials !